Perfect choice if you're planning a business trip or considering a leisure travel. The hotel is located in central part of the city, in close proximity to various landmarks. Facilities and services include two restaurants with the finest cuisine, lobby-bar, 4 spacious conference rooms, and a relaxing spa-center. 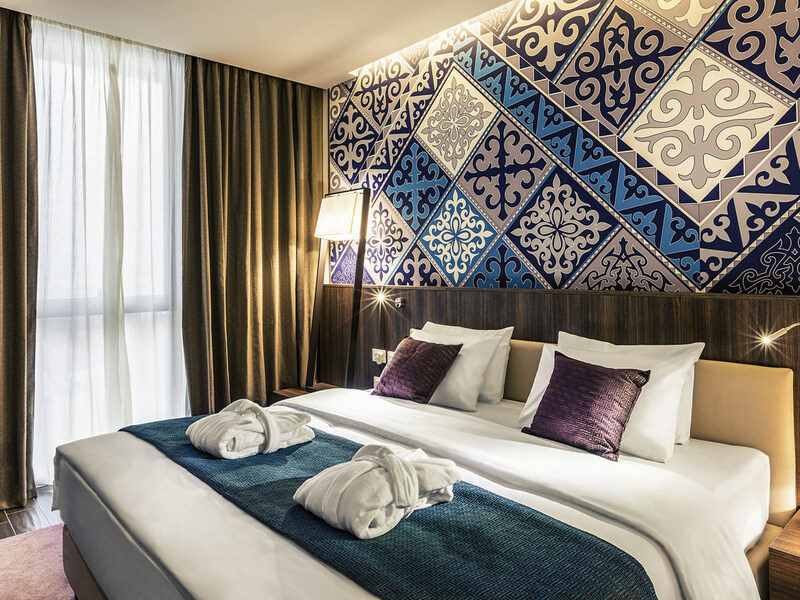 Hotel boasts 117 well-appointed guestrooms with unique inspired design by local culture and traditional art. Mercure Almaty City Center is perfectly located right in the heart of Almaty city. Historical places, walking areas and parks located very close. Two nearest subway stations within 5-10 minutes. SPA with great view on 11 floor. Magnificent SPA in the city located so high. Exceptional view from the Privilege Floor. The airconditioned 30 m² Standard Room, with one double bed or with two single beds, offers contemporary room design with features of ethnic style, wardrobe, mini-bar, LED TV, coffee and tea making facilities, WIFI, working area with a desk. The airconditioned 60 m² Superior Suite Room, with king size bed with a living room and a sofa offers wardrobe, walk-in closet, exclusive bathroom, mini-bar, two LED TVs, coffee and tea making facilities, WIFI and a working area with a desk. At the Lobby Bar guests can enjoy perfectly made fresh coffee, cocktails, wines and champagne with light meal menu.